At IBC 2013 there were a number of new technologies to be seen amongst all the hype of 4K this and all that. You may know the name of the Fraunhofer Institute as the people who brought us MP3. At this years exhibition they showed their work in many different fields of advanced video and audio. One project from their boffins at the Integrated Circuits division in Erlangen, Germany could be quite influential. The Light Field TV camera works a bit like the multi-cellular eye of a fly. A matrix of simple low cost cameras is used to record a scene from a number of slightly different viewpoints. By using image processing the collected views can be transformed into any new view required in post-production. This includes being able to change focal plane or depth of focus and dynamic panning moves. 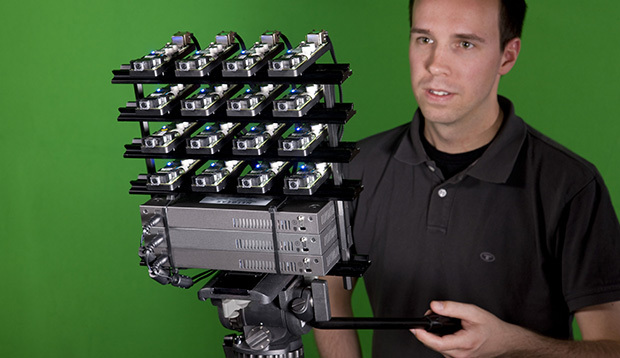 In the prototype shown, the array consists of 16 cameras in total, arranged in four rows and columns. The cameras collect the light rays at various points in the scene being shot. Each camera is similar to the single chip devices used in mobile phones and so is very cheap. The researchers speak of having captured part of the light field from the scene, instead of only one specific perspective. Although the prototype array consists of 16 cameras, its cross section is only 30 cm by 30 cm its small enough to be used on the set and in the studio. What they are also thinking of is a much bigger array up to 100 x 100 which might very well be wall sized. Such a beast would not need to be moved like a conventional single view camera. It would record a huge data set from which any possible viewpoints or move transitions could be extracted in the edit. But how does that work, being able to edit the recording so much better retroactively? The software estimates a depth value for every pixel recorded by the cameras. It therefore determines how far from the camera array the object portrayed is located. Intermediate images can be calculated in post-production from this depth information. As the camera operator films the subject, each of the outer cameras is able to look a little bit behind the subject they have a different angle of view than the cameras located in the middle of the array. After the recording is made, the filmmakers are able to virtually drive around a person or an object, and to change the camera angles and depth of field. The prototype camera cell each has its own flash memory for recording. Standard networking connections then allow the data from all cells to be collected for image processing after the shoot. So in fact the camera itself does need to be very high-tech and yet could be capable of high resolution in any computed view. Lens distortion and other deflects can also be compensated for. You could also get multi-view and 3D too out of the same data. Fraunhofer also showed something else as a low cost solution to HDR (high dynamic range) recording I will explain in next months column. The Fraunhofer people have already developed the software for processing the recording from the camera array. The graphical user interface is also ready for recording on set. The researchers are still working on the user interface for the post-editing at present; they should be finished in about six months. So it might be some time before the Light Field camera could become a commercial reality if a manufacturer eventually takes the project on.